*Destem chard by pulling leaves off from tip to root end. Roughly chop leaves. Chop stems into ¼-inch pieces. *Rinse and thinly slice fennel. *Peel and thinly slice shallot. *Slice ½ of lemon into thin rings. *Season fish with salt and pepper on both sides. *Cut 2 tablespoons butter into small cubes. Layer 2 sheets of parchment paper on counter or cutting board side by side for each fish. Evenly divide fennel, chard leaves and chard stems between two sets of parchment. Top with fish, followed by lemon slices, shallot and butter. Sprinkle with salt. To wrap each parcel, fold two opposite sides of parchment paper into the middle and fold together. Roll the other two sides into the middle several times to tightly seal into a small packet. Place on sheet pan and slide in heated oven. Cook 20 to 22 minutes. Fish should be opaque and flaky when done. Strip leaves off dill and finely chop. Mix together with juice of remaining 1 ½ lemons, 2 tablespoons olive oil and ½ teaspoon salt. Stir well to combine. Season with salt to taste. Unwrap fish and serve on two plates. Drizzle with lemon dill sauce. 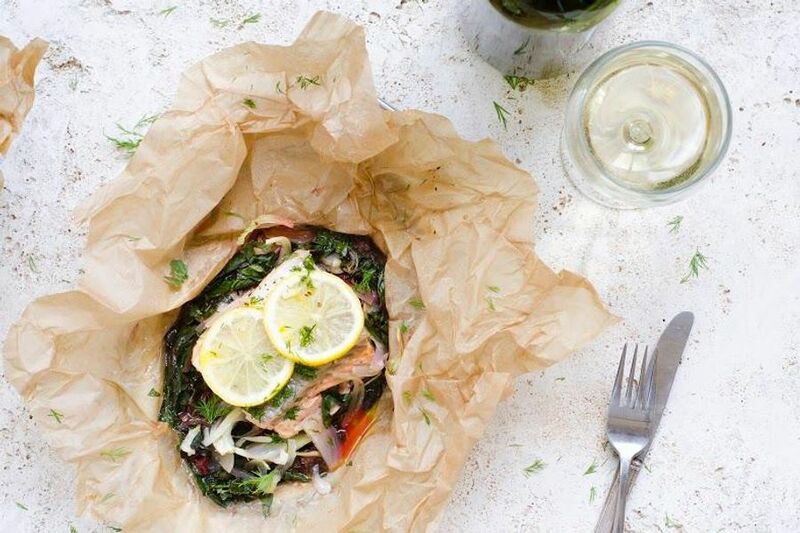 Steaming fish in a parchment paper packet is a technique known as “en papillote.” It is a surprisingly simple way to cook fish with very little fat and lots of flavor. Lemon, shallots, dill and fennel introduce bright spring flavors to omega-rich Arctic char over silky steamed chard.